The Santa experience can be overwhelming! 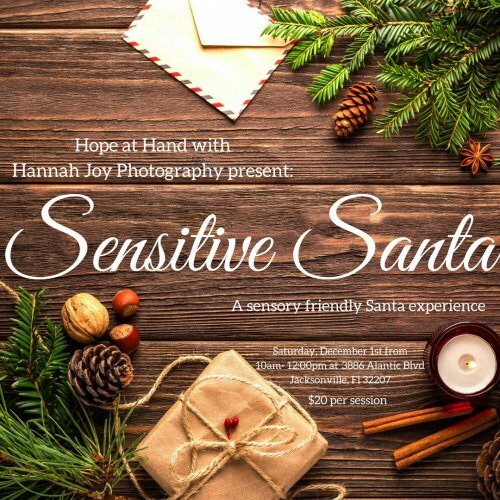 Hope at Hand and Hannah Joy Photography are partnering to provide a sensory-friendly photo shoot with Santa for children in North Florida. We are prepared to make accommodations for the comfort of your child. A sofa is provided so children don't sit on Santa. Santa can even sit on the floor or stand behind the sofa. Santa is flexible! 2 digital prints included with your 10 mini-session. Sessions run every 10 minutes: 9-9:10, 9:10-20, 9:20-9:30, etc. Please request your preferred time and slots will be filled on a first-come, first served basis. Please email HopeAtHand@HopeAtHand.org to schedule your time. Special thanks to Santa Dan, www.santasspecialkids.org. Santa Dan works hard to make kids happy all year long. By appointment only. Email HopeAtHand@HopeAtHand.org for availability. Sorry, refunds are not available and will be considered a donation to Hope at Hand in the event you are unable to make your reservation. About Hope at Hand, Inc. Hope at Hand is a 501(c)(3) charity that provides poetry lessons for at-risk youth populations in North Florida. Founded by veteran educator Steffani Hendricks Fletcher in 2009, Hope at Hand combines poetry and art to help youth process life, love, and progress in a changing world. Hope at Hand partners with over 15 youth agencies in North Florida. Hope at Hand programming instills confidence and independence while improving social connections and emotional growth through poetry. All poems presented incorporate the concepts of choice and change. To make a donation or to learn more about Hope at Hand and its partners, visit www.HopeatHand.org. Hope at Hand is registered with The United Way of Northeast Florida.